All of the best medieval weapons are now available for iPhone and iPod Touch! Everything from swords, crossbows, maces, axes, and much more! Medieval Weapon Builders lets you do everything from choosing your own custom weapon, use it, move it, and even battle it out with your friends. Accelerometer is supported so every move of your iPhone will move the weapon! Press your own weapon or shake and tilt your iPhone to see and hear every medieval weapon! You can even choose your favorites and use them over and over again. 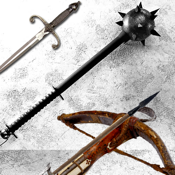 ◆ Realistic Medieval Weapons - including loud sounds and movement effects. ◆ Uses the accelerometer so you can actually move and shake your specific weapon to use it like in real life! ◆ View your favorite medieval weapons of all time! ◆ New weapons coming soon! Arbalest, Axe, Crossbow, Blade, Club, Daggers, Swords, Spears, and More! Build your skills at mastering each weapon. • Runs on all versions of iPhone, iPod Touch, and iPad.